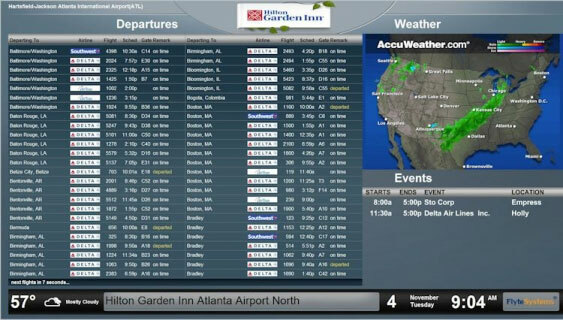 Hilton New York JFK Airport enhanced guest travel services with the addition of live Doppler radar to its airline information FlyteBoard by Flyte Systems. Guests can instantly see national weather patterns that may impact their trip as they verify their airline’s flight schedule and departure gate before boarding their airport shuttle. Flyte Systems is the leading provider of cost effective airport travel information displays and digital signage content for the hospitality, digital signage, and convention center industries and related businesses. 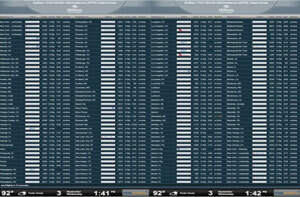 Click here to request information on Flyte Systems’ airport travel and guest information services. Mandarin Oriental, Boston gives guests the gift of more comfortable – and confident – travel this holiday season by implementing FlyteChannel onto all of their guestrooms televisions. 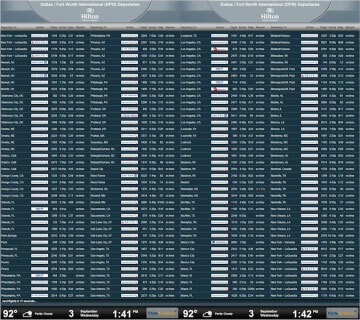 FlyteChannel, developed by Flyte Systems, provides real-time airline flight information for Boston’s Logan International Airport. Flyte Systems is the leading provider of cost effective airport travel information displays and digital signage content for the hospitality, digital signage, and convention center industries and related businesses. The Hilton Garden Inn Atlanta Airport North is adjacent to ATL, the busiest airport in the world. 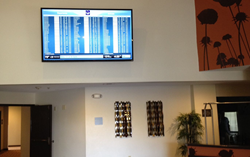 To make guests’ travel experience as graceful as possible, the property tapped Flyte Systems to add its Event Module to the hotel’s FlyteBoard real-time airline schedule display for cost-effective property announcements and travel information on one display. Flyte Systems is the leading provider of cost effective airport travel information displays and digital signage content for the hospitality, digital signage, and convention center industries and related businesses. Click here to request information on Flyte Systems’ airport travel and guest information services. 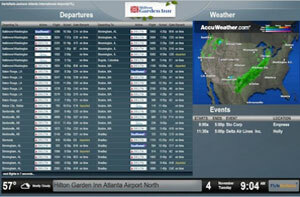 “About 80 percent of our guests come through Atlanta Hartsfield International Airport. The best service we can provide is to simplify their travel experience and make their stay with us more pleasant,” said Shawna Smalling, Sales Manager for the 174-room Hilton Garden Inn Atlanta Airport North. “Flyte Systems’ real-time flight information is valuable and now we have property events, meeting listings, and wayfinding on one combined display. All the information a guest needs for business and to confirm their travel plans is in one place.” The property’s combined Event display and FlyteBoard also shows national Doppler radar and is used by meeting planners to welcome VIPs and group members. CHICAGO, IL September 25, 2014 – Flyte Systems announced that the Hilton Arlington in Texas placed two FlyteBoard displays in its new lobby as part of its multi-million dollar renovation. The transformed full-service Hilton now shows real-time arrivals and departures for nearby Dallas/Fort Worth International Airport that provide guests accessible technology and convenience. The Hilton Arlington is owned and operated by Interstate Hotels & Resorts. Flyte Systems is the leading provider of cost effective airport travel information displays and digital signage content for the hospitality industry, digital signage, convention centers and related businesses. 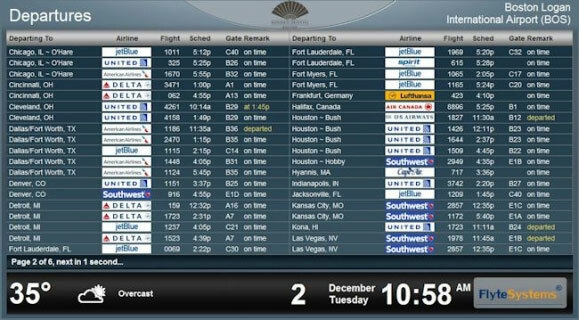 It is the only full service flight information display solution that provides subscription-based real-time flight departure information. Click here to request information on Flyte Systems’ airport travel and guest information services. Hilton Arlington’s General Manager James Shandor said, “The two new FlyteBoards in our lobby save guests and our staff time. Guests can simply look at the FlyteBoard for their flights. 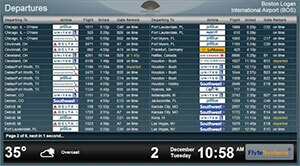 Plus, FlyteBoard also gives guests their flight’s terminal location. This is a life saver for travelers going to DFW since American Airlines uses four terminals. The display is easy to understand and a great convenience because guests recognize it as exactly what airports use around the world.” Hilton Arlington recently completed a total property renovation that included FlyteBoards as part of their ‘accessible technology’ guest innovation package.